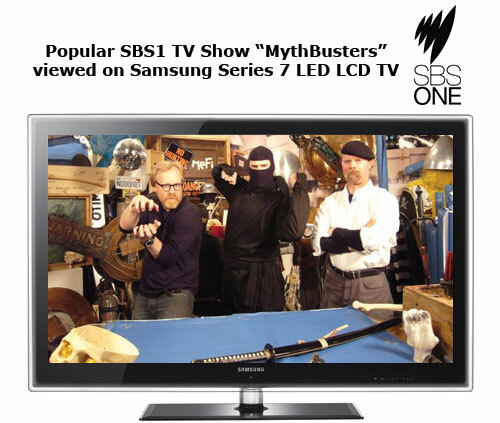 GUEST ARTICLE: Many people are unaware of the visual and audio benefits Digital TV offers compared to analog TV, the extra digital only channels available like ABC2 and that analog TV will be slowly phased out in Australia by 2013. Digital TV has been available in Australia for many years, since January 2001 in major cities and a phased introduction in regional areas since 2003. What does Digital Television offer over Analog? Improved Picture Quality – standard definition broadcasts are superior to their analog equivalents, ghosting is also a thing of the past. Widescreen Broadcasts – rather then the squarish screen on analog, a lot of programming broadcast is now in Widescreen 16:9 format, offering a greater view particularly with movies and sport. More Channels With Extra TV Shows – Several channels like ABC2, ABC3, SBS2 can only be watched through Digital TV. 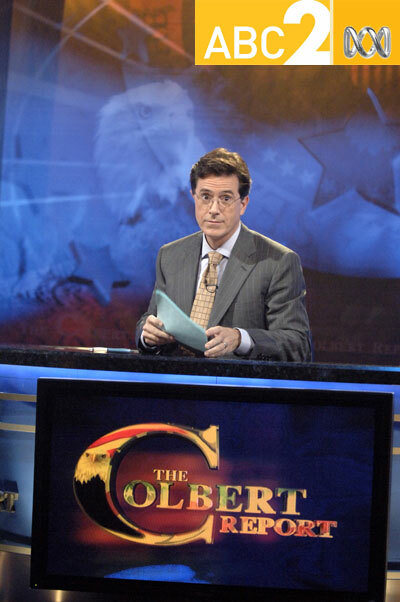 These channels show programs that aren’t on Analog TV like The Colbert Report on ABC2, ABC3 (for kids) and SBS2 (extra movies, drama and sporting events). 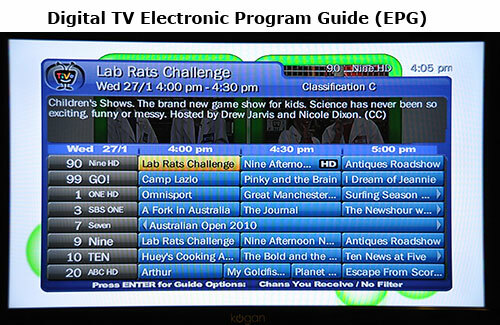 Electronic Program Guide – Each Digital TV channel broadcasts an electronic program guide showing both the program name and time as well as a synopsis. For most broadcasters, that extends to 7 days in advance. 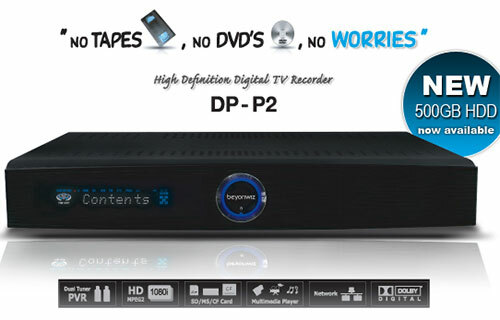 Easy Recording & Playback – If you watch digital TV using a PVR (Personal Video Recorder) like the TiVo HD 320 or Beyonwiz DP-P2 then you can also record shows onto the PVR’s internal computer hard drive to watch later. PVR hard drives can usually store at least 30 hours of HD TV or 100+ hours of SD TV. Digital Television was introduced in metropolitan areas in January 2001, with a phased introduction in regional areas starting in 2003. During the allocation of broadcasting spectrum for digital services, two extra services (termed Channels A and B) were set aside for future use. 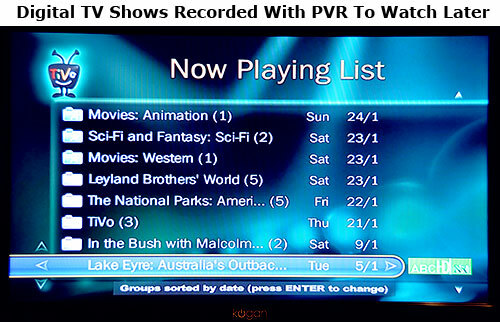 In Sydney, one channel has been used to trial a Datacasting (on-screen data, such as TV guides and news) service since 2003, no permanent future direction has been determined. When the timeframe for switchover was announced in 2007, only 28% of households had converted, today that figure exceeds 50%, assisted greatly by the addition of extra digital-only services in 2009. What’s the difference between High Definition and Standard Definition Digital TV? There are two types of channel being broadcast: High Definition (HD) and Standard Definition (SD). HD has a higher resolution then SD. This is determined by the number of lines that are broadcast in a picture, a SD picture contains 576 lines, whereas a HD picture can contain up to 1080 lines. Under the Australian Standard covering digital television, a broadcast of 576p is classed as HD, currently ABC and SBS broadcast their HD service in 720p, while the commercial networks broadcast in 1080p. The ‘p’ refers to the user of progressive scanning, where the image broadcast is ‘drawn’ on screen in sequence, as apposed to ‘i’ for Interlaced where the odd and even lines are drawn alternatively. All SD broadcasts are in 576i. What Digital TV Channels can I get? Nine – Nine HD, GO! For all the networks bar Ten, their High Definition channels carry a HD version of their main channel. 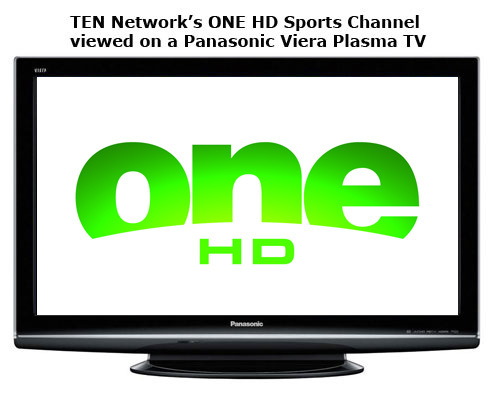 With Ten, their HD channel is their sports channel ONE, they also carry a SD version of the same channel. For those living in regional areas, access to the non-national (ABC/SBS) extra channels is not guaranteed. Currently, all bar the One SD service are available to regional viewers in Queensland, NSW, Victoria and Tasmania. The Freeview website outlines what channels are available in each metro and regional area. The three metropolitan commercial networks have also flagged the addition of a new digital-only service towards the end of this year, while ABC will launch a fourth channel, ABC4, a dedicated 24-hour news channel later this year on their current HD service. Each commercial network is allowed two standard definition channels in addition to their high definition channel. When does my area I switch to digital only broadcasts? Between 2010 and 2013 the country will switch to digital only broadcasts in a phased approach, starting with the Mildura/Sunraysia area by June 30th and Broken Hill plus Regional South Australia by December 31st. Conversion will end in 2013 with the metro markets. Unlike the United Kingdom and New Zealand that also use the Freeview name for their Digital Television platform, in Australia it is the name that the broadcasters use to market the platform. Formed in 2008, Freeview allows the broadcasters to have a consistent promotional and marketing platform to promote the technology. As well as promoting digital television, the brand is used to certify products that meet the technology requirements of the broadcasters. These requirements are more strenuous then the Federal Government’s initiative. Currently, in order for products to obtain Freeview certification they must be high definition capable and recorders must block the ability to skip advertising and enforce digital rights management. Freeview certified devices must also be capable of processing data in the MPEG-4 standard, which is less data hungry then the currently used MPEG-2, such a move future-proofs the device for when MPEG-4 broadcasts are approved. The advantage of this standard is that higher quality transmissions or more channels can be broadcast in the same frequency in comparison to the current standard. As it stands, non-Freeview certified equipment can access services advertised by Freeview (assuming you have a high definition device) – however future initiatives like a more interactive program guide may not be available when they become available. How do I convert to Digital TV? There are two ways you can convert, either purchase a set top box or recorder to connect to your existing television or purchase a new television with a digital tuner built-in. For those looking to record programs from digital you’re best off buying a PVR. Neerav has explained what a PVR is and it’s benefits in another article on this site. Capable (Blue Label) – only able to receive digital television when attached to a set top box or recorder. Most LCD and Plasma televisions sold today are Digital Ready (at a minimum SD), but the number of televisions that are HD ready is also growing, particularly as new models are released. The traditional bulky CRT ‘tube’ televisions are being phased out by manufacturers for ‘flat-panel’ LCDs and Plasmas which provide better quality picture, are lighter and much thinner. The Digital Switchover Taskforce maintains a list of digital ready devices such as Digital Set Top Boxes and PVR’s. Several of these have been reviewed on this website in the Camera, TV and Portable Video Reviews area. This guest article has been written by my friend Thomas Baxter (@bacco007 on Twitter). Thomas is an expert in the field of Spatial Science Technology & Information Systems and a regular contributor to MediaSpy News Updates. I lived in the US for a while and they have more programs as well as better offers. Now I’ve came back home and I’d love to see in HD certain programs I started to enjoy while in US.